Spiritual qigong is the BEST REMEDY for karma. What’s that? Karma is just another name for fate. The idea is that you are not just a body, heart and mind but also have a spirit (subtle energy) that transcends birth and death. Karma is really just the play of such subtle energies — and as you know, fate can be, in turns, both pleasant and painful. No one wants the bad stuff. What to do? The perennial solution gifted to humanity comes from spiritual teachers and adepts who urge us to align our actions with nature and Spirit. And, in fact, this IS the best possible course of action. Why? And, even more importantly, how does one get on-board with this plan and way of living? The following video gives you a clear and succinct summary of the path. In modern terms, you would likely hear it called Integrated Energy Medicine, an approach that consolidates the wisdom of western science through to advanced eastern energy medicine and yoga. Traditionally, this is the Dao—a way to accord with Nature. Hello Folks. Everyone’s got great advice about something or another. And, plenty of opinions about a whole lot else. Which is good, this is simply how it is—just take your pick on what to listen to and believe. However, you should really understand that all the variety in this world falls pretty much neatly into place within an integrated model that matches BOTH the wisdom of modern science and society AND the wisdom of ancient cultures and mystical traditions. The below three columns summarize the key points and provide links to further details. Qigong consists of two words: qi (energy) and gong (skill). These exercises promote health by regulating the electrical flows in (etheric) and around (astral) the body. Because the planets operate at higher levels, it's possible to shield yourself from their negative effects which have to trickle down through the astral and etheric levels to get to your body, heart and mind. While not a foolproof charm to protect you from any and all cosmic debris, qigong is, nevertheless, the BEST practical remedy on the planet. It’s been used in China for this purpose for thousands of years—and with good success! Planets act like guides. At specific times they step to the foreground and work to help you learn valuable lessons about yourself and your path in the world. The energy that showers upon you must take form and manifest. However, it's up to you what form the energy takes. If you learn about and emulate the better qualities of your planetary teacher, the power it wields will take shape along the lines of these better qualities. Otherwise, much like Murphy's law, the lessons will tend to be less helpful. This IS the place to start your journey to fulfillment, health and any other worthwhile goal you might have. While you don’t need to be a versed Jyotish astrologer to succeed, you do need to be canny and listen to the good advice. The ultimate fix for karma lies deep inside yourself—in the stillness of meditation and prayer. Through consistent practice, you can begin to develop a more focused mind and with it, learn to speak more directly with your spiritual teachers. In Vedic astrology, the planets operate at the mental and causal levels (much deeper than the other levels mentioned here). Deep meditation can reach these levels. From here, the great spiritual adepts help us to achieve our fullest potentials. This path requires knowledge (Jyotish) and ability with energy (qigong) and mind (yoga). Lord Ganesha, the elephant-headed remover of obstacles, holds a special place in the Hindu pantheon of gods and goddesses. With a pot-belly, multiple arms and adoring mouse for an attendant, he presides over all beginnings and so oversees endless waves of invocations each day from people across India and throughout the world. This day, Ajay, a dignified elderly devotee clambered his way across the temple steps to take his seat in front of Ganesha’s statue. As usual, he began by calling on the lord for protection and then proceeded to meditate. The rich subtropical colors and wafts of sandalwood incense provided a comforting backdrop for practice. “Focus on his image, focus on his image,” he reminded himself. And as usual, Ajay soon was adrift in his reveries: “His tusks look like curved pencils. Did I make a list for the laundry? Ah, our visit to the zoo. What a time! The lions roared so and I spilled tea on my shirt. But the monkeys—oh my—how they played with us.” From Ganesha to monkey to endless mindscapes across the firmaments: Ajay sat in fine form but his mind did not. 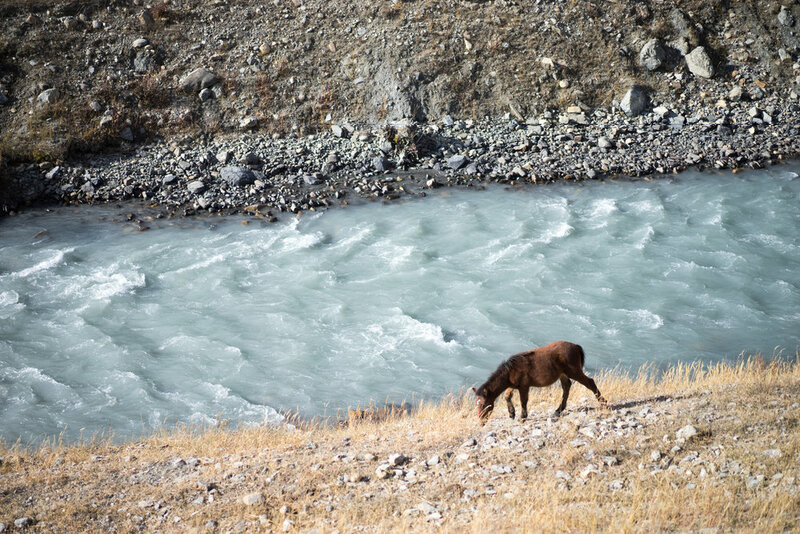 Himalayan river — Care to cross? Everyone wants to succeed. In yoga, the outer boroughs of ultimate success—enlightenment—first sway into sight once meditators garner highly focused and stable mental concentration into their everyday experience. However, such a harbinger of real success comes only to a few even though many wish to tread this spiritual path to its heights. Sophisticated meditative approaches such as the yogic traditions of India, China and Tibet clearly map the terrain at the heights of spiritual ascent. But they are recipes that miss the heart of effective complementary medicine, namely feedback. The situation resembles having a doctor across the river shouting instructions to travelers about what to do once they ford the swirling currents. Not much help getting them started and even less help in keeping them on course if they brave the waters with such rickety advice in the first place. In contrast, the tools of modern integrative energy medicine provide much better leverage for the battle with monkey mind. These web pages explain how to harness qigong using acupuncture meridians and microsystems for instantaneous feedback and control of the meditative process. Instead of endlessly wrestling with your mind while trying to control it by willpower, you can learn to adjust the flow of biological energy along meridians and microsystem meridians to achieve a better result in novel time and with ease. The micromeridian meditation detailed here knits together three great streams of yogic practice—Indian, Daoist and Tibetan—and unveils an easier way to link their chakra-, meridian- and space-oriented approaches to higher consciousness. Advanced yogic practices simply cover more ground than any other technology or human endeavor to date. The chart below contrasts the span of these three yogic paths with Vedic astrology (a traditional Hindu map of higher-level energy systems), traditional eastern medicines (Ayurveda, Traditional Chinese Medicine) and modern western medicines. The left axis increases from matter to energy to information. A higher level (more towards the top of the graph) implies a more complex pattern that can transform or control lower level processes. You are likely familiar with the terms "matter" and "energy" from physics and the popular press. The term "information" is used by mathematicians as an abstraction of these physical ideas. Information represents a more fundamental property of nature. Loosely, it corresponds to the consciousness achieved by very advanced yogis and mystics—a state commonly called enlightenment. In broad brush, each yogic tradition focuses more on one spatial—and hence neural—aspect (midline – Indian, meridian – Chinese, space – Tibetan). This means that different areas of the brain will light up for different spiritual practices. Modern neuroscience suggests that whole-brain processes (those that integrate activity in multiple areas of the brain) generally relate to higher-level function. Advanced yogic practices aim to cultivate just this state by linking left-brain processes (sequential; referential) with right-brain processes (spatial; physiological; emotional) to garner whole-brain functioning. The result? Emergent—and quite extraordinary—capabilities such as clairvoyance, psychic healing and a raft of other exceptional abilities as documented in the spiritual literature and now being validated with rigorous scientific research. This just means that successful yogic practice leads one to foundational levels of energy (information; consciousness) where true healing and happiness can occur. Thus, the best medicine for healing the whole person should make use of all the world's wisdom—modern approaches such as western medicine (for acute conditions), traditional eastern medicines (for most chronic conditions) and body-mind-heart-spirit approaches such as traditional yoga. The essential first step: an outer practice that balances and charges the body's energy. Qigong has been around for thousands of years. The first recorded evidence to show that the practice was alive and part of Chinese culture dates from the Zhou dynasty in the fourth century B.C.E. Qigong is a form of gentle exercise that can be used for self-health, medical treatment and even spiritual development. Qigong consists of two words: qi (energy) and gong (skill). Taken together these words suggest a practice oriented towards regulating physiology. And, in fact, qigong is just such an exercise. It consists of gentle movements alternating with some periods of stillness. There are hundreds of styles but they all aim to integrate body movement, breath and thought leading to improved health. The roots of qigong reach back five thousand years to ancient China. This form originated primarily from early attempts to preserve health and prevent illness. Over the centuries, it evolved as part of Traditional Chinese Medicine. In modern times, western research has validated many of its medical benefits. So much so that this approach is now called Chinese Medical Qigong, a branch of medicine that receives government sponsorship and much research. Although qigong had some relation to ancient shamanism, it was first clearly applied for spiritual pursuits in the form of Daoist Qigong which can be traced back to the Qin dynasty (about 220 B.C.E.). The Dao De Jing written during this period laid the foundation for this form of qigong. The aim of Daoist Qigong is the cultivation of health, longevity and spirituality. The most famous exercise from this approach is known in the west as the microcosmic orbit and is a circulation of qi along the midline of both the front and back of the body. The vital second step: the bridge from the astral (lower) to the causal (higher) energy realms is dotted with powerful archetypal patterns that need to be navigated gingerly. Jyotish astrology (from the Hindu tradition) provides the best model for understanding what this path from lower to higher energies looks like and what needs to be done. Once you understand what you are dealing with you can start to apply qigong and other more advanced practices to harmonize these archetypal patterns. What's in a name? Or a chart, for that matter? Here are two charts for a fellow named Ramana Maharshi. Ring a bell? If you recognize the name, then it says heaps and heaps. If you don't recognize the name, then it is likely just some funny foreign sounding name. Just the same way, these two charts provide key vantages in Jyotish for grasping the essential character of a person. If you know some Jyotish and recognize what the circled items stand for then, again, the "name" says a lot. Otherwise, the charts just look like some variant of a skewed tic-tac-toe game. The goal here is not to get inundated by endless symbols and minutia that can have no practical relevance to anyone outside of an astrologer. Instead, tease out the essential few facts that make all the difference. And run with that. So what are the few facts here? The chart on the left indicates that this person has a strong inclination toward spiritual experience and not much else. One-sided drive, for whatever, may not be a good thing for most folks. In this case, though, the chart on the right gives two thumbs up to spiritual quests in any shape or form. And bingo, you have Ramana Maharshi, a great spiritual master from India who lived up through the middle of last century. Would the outcome be the same if another person were born with the same chart details? Maybe but maybe not. A chart acts as a template for experience. It does not completely determine the details. Here’s where you come in. Free will factors into the equation. Inner energy work for the Jyotish archetypes. Daoist practice consists of three stages: weigong ("outer" qigong), neigong ("inner" qigong) and neidan (meditation which amplifies the results of weigong and neigong and takes them one step further by integrating the individual with the cosmic field). The third and fourth levels of neidan yoga focus primarily on developing neigong skills and then integrating them with Jyotish archetypes of higher energy patterns. So, these two levels of the work lay a foundation for integrating neigong and weigong skills with higher energy patterns. Neidan then picks up the ball and threads these outer and inner qi flows into the cosmic matrix that surrounds and supports us all. In terms of the Daoist model, these levels of neidan yoga include advanced weigong, neigong and the preliminary stages of neidan. Advanced inner energy work incorporating qigong and neigong along with visualization, devotional practices, pranayama and meditation. The next stage along the spiritual path broaches the waters between self and Self. An example from Tibetan Buddhist practice is vajra breathing, which entails sending prana up the midline and out of the body to greater and greater spheres; in turn, such energy is culled back to the individual so that a rhythmic flow ensues. Progressively, a resonance between little self and Big Self develops which eventually pulls individual consciousness to a higher plane of existence. In terms of the Jyotish star map, the focus now tracks through the astral and mental lokas (levels) (D-9 chart) to the causal loka (heavens of the devas such as Indra; this loka correlates to the galactic center in Sagittarius) (D-27 chart). More advanced work (levels 5 and of Neidan yoga) raises the stakes and aims for larger and larger pieces of the cosmic turf (super-galaxies, galaxy filaments, superclusters and quasar groups all the way up to the Hercules-Corona Borealis Great Wall (currently the largest known cosmic structure within the universe). This work covers insurmountably amazing levels of experience and in the Hindu model relates to the higher lokas of the rishis (advanced sages) and purest devas. The related Jyotish varga charts include D-40, D-45 and D-60. The next step, if you want even more, takes a spiritual seeker to the doorstep of Devi, Herself. That is, the universe itself stands as the final ordinary (physical) metaphor for spiritual progress. And, although many spiritual masters posit that "all One" is the end of the road, most likely it is not. That is, we all are simply part of a much greater universal dynamic system. So, becoming part of the One makes sense and has richness beyond compare. However, to think that our little vantage on Devi captures Her whole being and grace is slightly near-sighted, to say the least. Throughout all history, humans have modeled nature and judged their model sufficient and complete. It doesn't matter whether the model comes from space ships, savants or simply inspired folks, the best bet would be to take a model—ANY MODEL—with a grain of salt and then just go with the flow. The Daoists say it well, "The Dao that can be named is not the Dao ... Knowing enough to stop when one does not know is perfection."